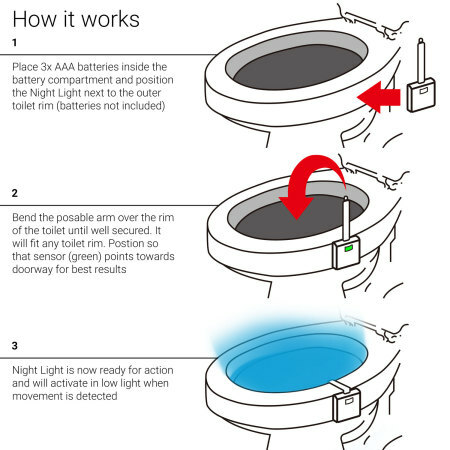 Enhance the look and functionality of your toilet with this ingenious device. 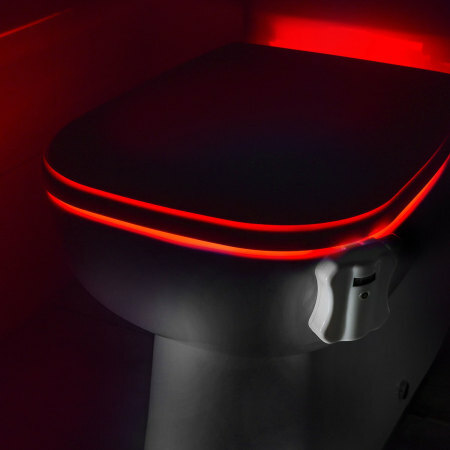 Add coloured mood lighting, help toilet train children, keep your bathroom clean or even just save electricity with the AGL Motion-Activated Toilet LED Night Light. 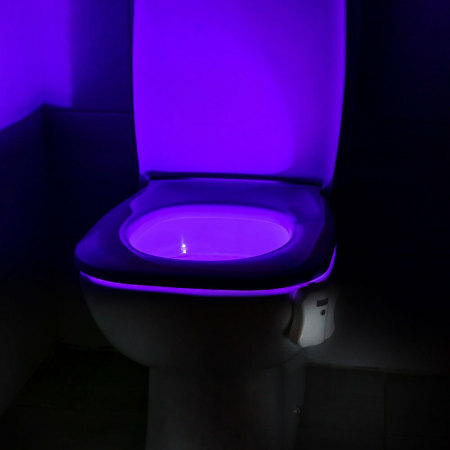 Toilet night light very pleased!! Does exactly what it says and is really easy to use. Light is bright and am really happy with this product. Also excellent service 5 stars all round!! Sometimes you buy little gadgets and things and you don't know whether they're worth it or not, but when they're nice and cheap it just seems worth giving it a go, even if they do turn out to be no good. Well, this little gadget isn't one of them - IT'S BRILLIANT - literally. It's what I've been wanting for ages, a solution to getting up in the night and actually seeing what I'm doing in the ensuite without putting the light on and waking the wife. Now all I have to do is work out how to get back without walking into the end of the bed! Worth every penny - no home should be without one. There are so many good reasons to by this device that it's hard to know where to begin. But let's begin with just how cool it looks. Enhance the rather mundane activity of going to the bathroom by adding this awesome night light to all of your toilets. Now, instead of blundering into the darkness trying to find the light switch when you need to "powder your nose" or "see a man about a dog" you will have instant lighting in just the right amount. Just 3x AAA batteries (not included) will last you around 30,000 hours of use and they're much cheaper than switching on the main lights and won't startle you awake either, so you can save pennies when you need to spend one and get better sleep too. The light sensitive detector knows when it's daylight too, so no wasted battery power either. This awesome night light is water resistant and easy to clean, meaning there is very little maintenance involved. It will fit ANY toilet on the market. It will fit your toilets. 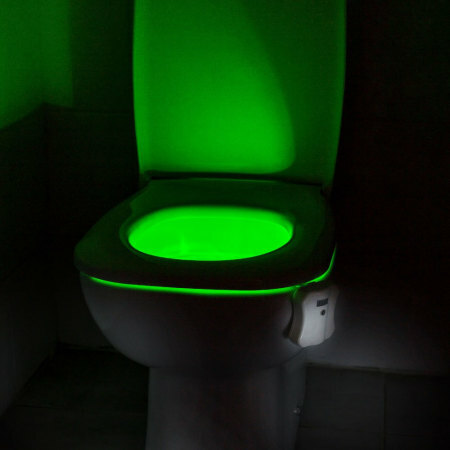 Now you'll never need to worry about whether you forgot to switch off the light. 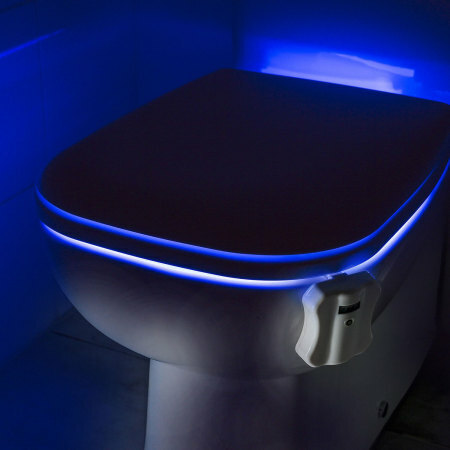 The Motion-Activated Night Light from AGL features a passive infrared sensor, which is constantly scanning for movement. When motion is detected, the LED light will instantly switch on and stay on for 2 minutes, then blink off as soon as that time period elapses. 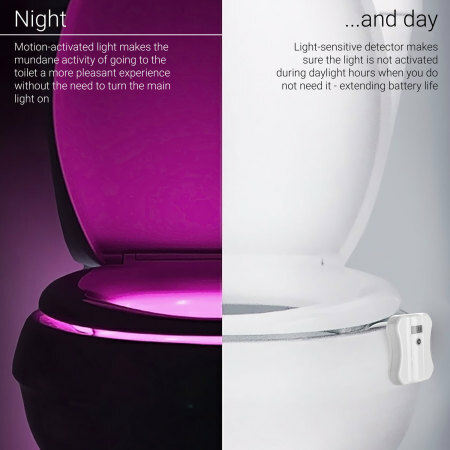 The motion sensor hardly uses any battery power, though - this is an efficient and convenient lighting solution. It can be a very stressful and trying time for parents and children when you're getting them used to using the toilet, or a potty. By adding this night light, you can make them more interested and more likely to use the toilet, making your job much easier and maybe even helping you to get some more valuable sleep. Children will appreciate and have fun with the light, and are more likely to interact with it. 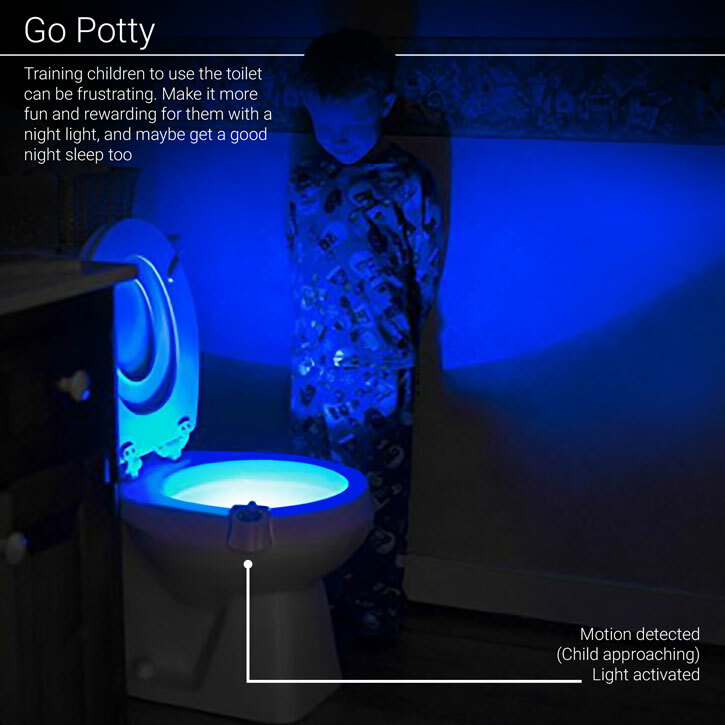 Every time they approach the toilet, it will light up like magic. Kids love magic. It is well known that 6 of out 10 marriages and relationships fail because of poor toilet hygiene. O.K that's probably a complete fabrication, but it is the source of many a robust disagreement. 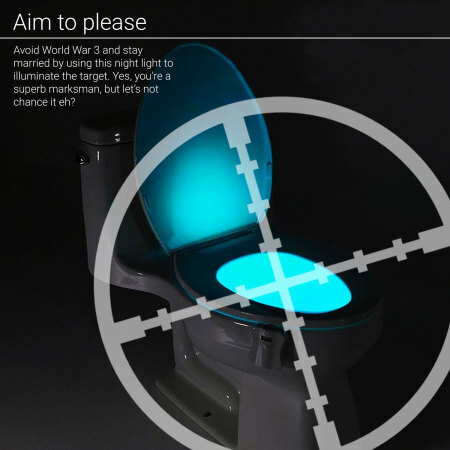 With the night light you won't miss your aim or forget to put the seat down if it's illuminated with vivid colourful light, right? Well, that's the hope anyway. 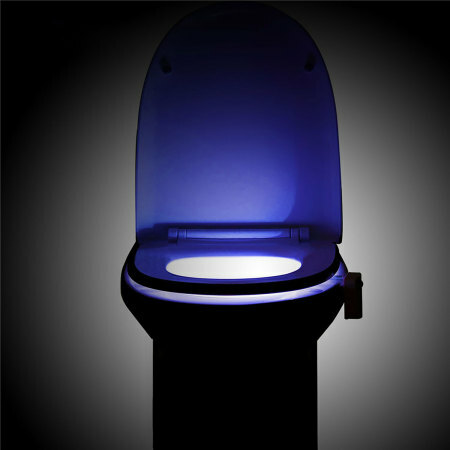 By using this light you can keep your bathroom cleaner for longer, saving you time, trouble and earache. Using just 3 AAA batteries, you can activate this night light for a staggering 30,000 hours - giving you a significant amount of time before you need to replace the power source. When you do, though, all you need to do is insert 3 more AAA batteries and you'll start fresh from the beginning of another 30,000 hours. Each cycle lasts 2 minutes - usually more than enough time to get the job done, and if you need more, just move. The sensor will give you more. 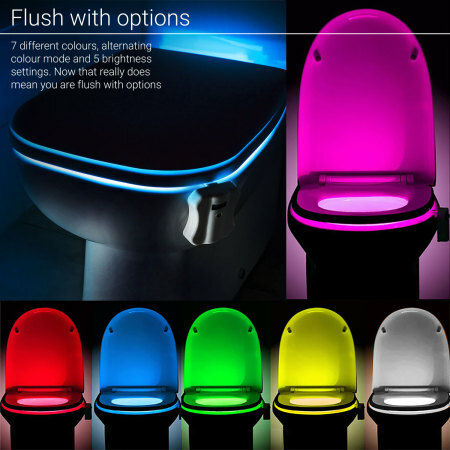 With 7 different colours (red, purple, aqua, blue, yellow white and green) to choose from, or an alternating colour mode - and 5 different brightness options, you have all the options you could possibly want to illuminate your loo. This handy light has been built with convenience in mind. An ultra-compact 18.6 x 11 x 4.4cm size complements a slimline, unobtrusive construction to ensure that it won't get in the way.